Aptly named, Bougival was the place Impressionists went to get their boogie on. Painting's a tough business to get in on, and everyone needs a break from the hustle. So when French art mogul Paul Durand-Ruel asked Renoir for three dance paintings, the artist knew exactly where one of them was going to show. The lady in Bougival, the one totally not having her partner all up in her grill, is Suzanne Valadon. An artist in her own right, and one of Renoir's early muses. She was the lady dance partner in two of the dance series for Durand, and Aline Charigot was in the third. Aline went on to marry Renoir, sure, but Suzanne hit that talent on the regular for years. She and Renoir even had a kid: the artist Maurice Utrillo. Renoir being Suzanne's baby daddy is still basically a rumor, but it's pretty hard to deny if you look at side-by-side pictures of him and Maurice. The Museum of Fine Arts bought this painting for $150,000 in 1937, which translates into $2.5 million in present day monies. Keeping in mind that the museum whipped out that kind of skrilla during the Great Depression, you know they obviously had a huge thing for Bougival. Which most people do, considering it's always the talk of the town in whatever exhibition brings it out of Boston. Still, haters are everywhere. The #RenoirSucksatPainting movement blew up on social media and in the news when they picketed the MFA in 2015. They called for the museum to put away all their Renoirs, including Bougival, to make room for other, worthier art. The museum, of course, didn't budge, and the movement seems to have since faded out. 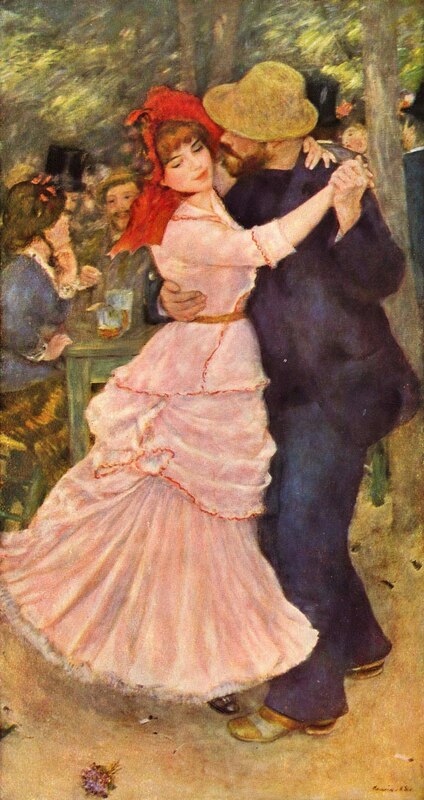 Dance at Bougival (French: La Danse à Bougival) is an 1883 work by Pierre-Auguste Renoir currently in the collection of the Museum of Fine Arts in Boston, Massachusetts, United States of America. It has been described as "one of the museum's most beloved works". The work depicts two of Renoir's friends, Suzanne Valadon and Paul Lhote. The setting is the French village of Bougival, about 15 km from the center of Paris. Many Impressionists including Claude Monet, Alfred Sisley, Berthe Morisot, and Renoir painted scenes there. Check out the full Wikipedia article about Dance at Bougival.